Streamlined Raye sandals cut from velvety suede. 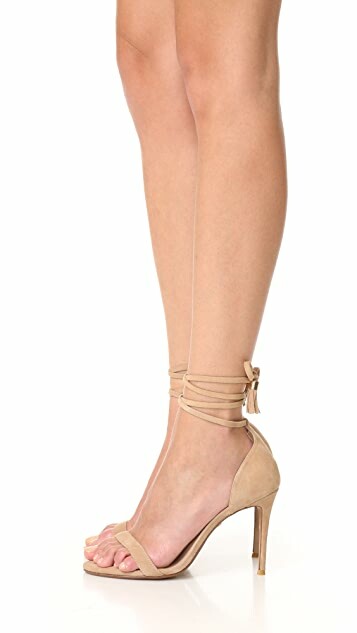 Tassels and gold-tone hardware trim the slim ankle ties. Lightly, padded footbed and covered, stiletto heel. Synthetic sole. LA-based footwear brand Raye—named after the Spanish word “reina,” meaning “queen”—was launched under the Alliance Apparel umbrella in May 2015. The collaborative design team uses knowledge acquired over years in the fashion industry to realize the brand’s core philosophy of balancing form and function, while maintaining a fashion-forward aesthetic. Raye footwear comes in a sweeping assortment of silhouettes, from classic pumps to fearless statement pieces, designed to take confident women wherever they want to go.